This Runfine Vitreous China Vanity fuses form and function for a tasteful addition to your bathroom. This vanity features a modern style, bringing a touch of sophisticated elegance into your home. It has a freestanding build, which makes it easy to install into any space. This vanity has a medium density fiberboard construction, providing a smooth finish that will not splinter or knot over time. It features a rectangular integrated sink, which is built out of the same material as the countertop for a seamless and smooth appearance. 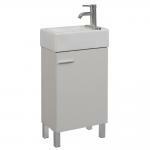 Featuring a white vitreous china build, the sink is extremely durable. Vanity Top Thickness: 1.57 in.